TripAdvisor, which has collected more than 50 million reviews from travelers around the world, is facing a critique of its own on its first day trading on the Nasdaq. The company, which was officially spun out of Expedia yesterday, is trading down $1.24, or 4 percent, to $29.01 a share, under the ticker symbol TRIP. Since Dec. 6, when Expedia shareholders approved the spinoff, the company had been trading temporarily under the symbol TRIPV. While TripAdvisor’s stock price is lower today, it’s trading higher than Expedia’s, which was up 76 cents, or 2.8 percent, to only $27.61 a share. The two companies picked a challenging time to conduct a split, with other recent IPOs, like Zynga, also struggling to trade higher. Kayak, a close competitor, has also decided to put its IPO plans on hold, however, that could change if the stocks perform well. The breakup of Expedia and TripAdvisor creates two distinct companies. Expedia, based in Bellevue, Wash., will be a travel agency focused on selling airline tickets and hotel and car rentals. TripAdvisor, based in Newton, Mass., will now serve as a travel-reviews site, operating in 27 countries and 19 languages. Without ties to Expedia, it can now solicit the highest referral fees from a number of travel agencies. Much of the thought process behind the split has to do with what Expedia thinks its business is worth, compared to Wall Street’s valuation, and how much it will be valued on its own. While Expedia’s travel agency business garners the most attention, it is TripAdvisor that has the bigger growth story. Now that it is solo, it will be important to watch how its independent valuations evolve. 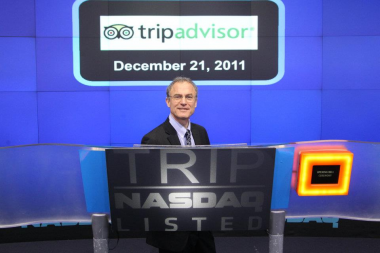 To celebrate the day, Stephen Kaufer, co-founder and chief executive officer of TripAdvisor, rang Nasdaq’s opening bell this morning — noticeably all by himself, without Expedia executives by his side.